I don’t remember the first time I had foie gras, but I definitely know when and where I fell in love with it: it was at Water Grill in Downtown LA, right before the turn of the New Millenium. Michael Cimarusti had taken over the kitchen from Allyson Thurber a year or two before. On this particular night’s five-course tasting menu, the chef offered up an appetizer of “foie gras au torchon” that was poached or somehow otherwise infused with cognac. It was insanely good. “Decadent,” was the actual word that immediately came to mind after I put that first bite of foie gras yumminess smeared onto a brioche toast point into my mouth. I was hooked, and fortunately for me, the portion size was extremely generous — almost too much of a good thing. Almost. 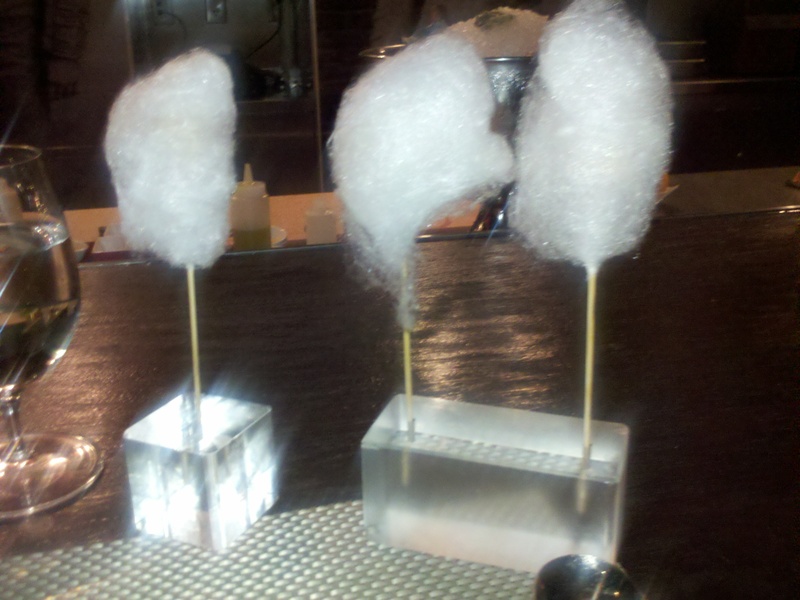 Cotton Candy Foie Gras Lollipops (The Bazaar by José Andrés): Each lollipop is a cube of foie on a stick, dipped in a little crunch, then put into a good ol’ fashion cotton candy machine (click HERE to see step-by-step pictures of the process). In one magical $5 bite, Chef Andrés whimsically distilled everything wonderful about foie gras in a way everyone could enjoy. I’d often go to The Bazaar just to sit at the counter and order 3 or 4 lollipops and nothing else. Over the past year or so, it is been listed on the menu as “cotton candy duck liver” (not “foie gras”) so I’m hoping the creation survives the foie gras ban. Foie Gras and Thinly Sliced Yellowtail (Le Bernardin, New York — Chef Eric Ripert): More precisely, it is thin slices yellowfin tuna layered over foie gras and toasted baguette, with shaved chives and extra virgin olive oil. Impeccable ingredients, prepared simply to allow the flavors to shine through. I would have thought the foie gras pâté would have over-powered the yellowtail, but it didn’t. Not sure why I doubted Chef Ripert — like Chefs Cimarusti and Andrés, Mr. Ripert is an absolute genius. Fortunately for the world, foie gras is still perfectly legal in New York. Unfortunately for me, I’m not planning on being in Manhattan any time soon. Chef’s Burger (Buffalo Fire Department — Chef Michael Shafer): First of all, BFD (as it’s known) is NOT located in upstate New York but rather in Torrance, CA. It is the casual, burger-filled foil to Depot, Chef Shafer’s more formal restaurant across the street. All of the burgers start with a half-pound of Angus Beef ground chuck (medium-rare, please), lettuce, tomatoes, onions, all served on freshly baked “Firehouse Buns” with a side of fries. The “Chef’s Burger” added seared foie gras, caramelized onions, secret sauce, and a fried egg with a beautifully runny yolk. The only thing it’s missing was a side of Lipitor. Not sure how the chef will modify this burger going forward or if he’ll take it off the menu entirely. As much I’d like to rant in detail about why I think the new California law banning the sale and production of foie gras is wrong and many of its supporters are hypocritical, I’ll refrain. Suffice it to say that I’ll miss the experience. In the meantime, I have something new to look forward to whenever I travel out of state. I decided to bring along a bottle of 2007 Rochioli Russian River Valley Pinot Noir. It was wonderful: bright, fruity, a bit of earthiness, that lingered long on the palate. Everything you’d hope for in a Russian River pinot noir. It would be wonderful for years to come, so it’s good that I’ve got one more bottle stashed away. Tags: Eric Ripert, foie gras, José Andrés, Michael Cimarusti, Michael Shafer, Rochioli. Bookmark the permalink. That’s a bummer, Lisa (missing the foie gras, not seeing all those operas and concerts). It took 2 years for Chicago to come to its senses and reverse their ban. I’m hoping it won’t take longer than that in California. In the meantime, Vegas is only an hour by plane or 4.5 hrs drive. Hahaha, yeah. I know there’s a lot I would HATE about Vegas (the casinos!) but the foie gras isn’t a problem. Also, Cirque de Soleil shows that don’t travel!